A histogram is very similar to bar charts. This chart is a combination of a line chart and a vertical bar chart. The data here is displayed with the help of equally sized rectangles. A histogram is used to display the distribution of information or data over a continuous time period. The area of the rectangular bars is proportional to the frequency of the variable. Histograms may have a similar appearance to bar charts but unlike them, are used to plot the frequency of variable occurrences in continuous data. This continuous data is divided into classes called bins. The majority and minority points can be easily spotted using these bins. Also, one should make sure while drawing a histogram as to not make the bins too thin, which can affect the frequency distribution flow or too thick, that will make it hard to see the change in data. Let us take the example of customers waiting at a bank. The above-given table gives us the survey data taken by the bank of the customers of their respective waiting time. This data sheet is plotted as a histogram, with 5-second intervals. The resultant graph is illustrated below. 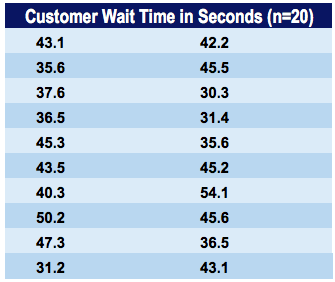 We can very well tell from this graph that, the customers have waited for most up to 35 to 50 seconds. As you can see, histograms are continuous and have no gaps, however, if there is no frequency value available for a particular point, gaps can occur. These gaps can be easily spotted and serve as another advantage of the histogram. In a basic type of histogram, the independent variable is plotted in the x-axis and the dependent variable is plotted in the y-axis. The rectangular bars are colored or shaded to denote different categories. Let’s look at an example of the same. Suppose a teacher is analyzing the final exam marks of her students. Each mark range is denoted by a different color. Multiple results can be drawn using this histogram, about the teacher’s teaching ability and the student’s intelligence. Histograms are not only useful in determining the minimum data point, maximum data point, and the median. But it is also used to find out the standard median of the data. The range of the chart from left to right, that is also called the class width of the chart, can be found out by using a histogram. There are many ways a histogram can be distributed. Here are a few types of distributions, that we are going to look into. In this type of distribution of data, the histogram forms an inverted V-shape figure. The data points occurring on one side is similar to that occurring on the other side. The illustration of this bell-shaped or single peak stepped structure is given below. This type of histogram distribution consists of two normal types of distribution. Thus indicating that data is collected from two different systems. In case of such a distribution occurrence, data is to be analyzed separately for both the peaks. In this type of histogram distribution, large values occur on the left side than the right side, making this graph slanting toward the right. This type of graph is also called a positively skewed distribution. This type of histogram is slanted towards the left. Unlike the right-skewed distribution, here, larger data values are found occurring on the right side than on the left side. This type of histogram distribution is also called a negatively skewed distribution. As the title suggests, the distribution of this histogram is random and a lot of peaks are visible here. Considering the shape of the graph, we can say that the data was collected from different sources or different groups. This type of graph usually occurs when there is a number of systems. In this type of histogram distribution, the peaks are all found to be almost of the same size, giving little information about the source. If such a pattern is formed, it may be due to less number of systems. Histograms help in displaying a large amount of data graphically, that is difficult to be put into tabular form. It makes it easier to display data that are of various types and frequencies. It is useful for the visualization of the distribution of data. With the use of a histogram, the median, distribution, and variations in data can be found out. Histogram tells us about the skewness of data plotted. These charts also help in predicting the future performance of the process. It makes it simpler to calculate the capability of a process. Data tables can be easily converted to histograms. Histograms are helpful in calculating the standard deviation of data. The range of the chart can be found using this plot. Histograms are among the charts that are, reader-friendly. It is easy to read and understand. Histograms are often plotted in order for assistance in decision making. These graphs are apt for usage when the data available is in very large ranges. For example, when taking the survey of students of a college, who park vehicles outside the campus. Only continuous data can be used while plotting a histogram. This form of chart is not very suitable for comparing two types of data. The exact value of data is not used for plotting, as data is always grouped or categorized. Unless plotted in a frequency distribution, the exact input of a histogram cannot be extracted from the graph. Histograms are charts that can be easily manipulated to support the desired result. Sometimes, the time difference in data is neglected while plotting a histogram. They are very inconvenient when comparing many different categories of data together. These were some facts about Histograms and its features. Hope this helped you understand what data is suitable to plot in a histogram. Why do we need Comparison charts?